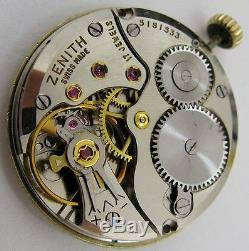 Manual winding Zenith watch movement 40T for project... 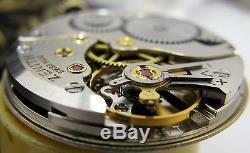 Serial: 5660082 dial(28.5 mm) is damaged by the water & sun... Light oxidation on the edges of the hands. Staff balance in good order, start to tick when I rewind the movement. Need to be cleaned & timed by a watchmaker to keep time with accuracy.. Nickel plated movement with subsidiary second in good condition, Characteristics: Diameter: 27.3 mm, H= 5.8 mm Good Luck. 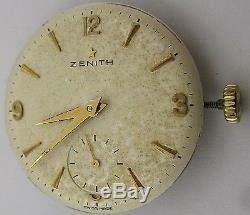 The item "Zenith 40T 17 jewels watch movement for part. Serial 5181533" is in sale since Saturday, June 18, 2016.